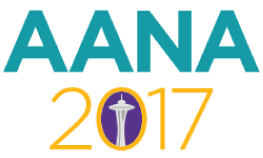 Richmond Dental and Medical exhibited at the American Association of Nurse Anesthetists Annual Congress in Seattle, September 10-12, 2017. The AANA represents more than 51,000 CRNAs and Student Registered Nurse Anesthetists (SRNAs). The annual meeting allows participants to network with manufacturers, distributors, and exhibitors, as well as attend courses and workshops for CE accreditation. At the Richmond Dental and Medical booth, we continued to provide Soft BiteBlock™ sample bags. Many nurse anesthetists were introduced to Richmond Dental and Medical’s Soft BiteBlock™ at last year’s Congress in D.C. For years, practitioners have rolled their own soft bite blocks to protect patients’ teeth and tongue during emergence from anesthesia. Now that Richmond has a readily available product with a consistent density, which will not compress below 7 mm, the patient’s airway is protected, too. With 94% of CRNAs being directly involved in patient care, it is important that they have a readily available product that has been tested and proven to protect the ETT or LMA. Whether you are CRNA in a hospital, surgery center, private or group practice, your time is important and best utilized monitoring and caring for patients. We invite you to check out Diana Roloff’s, CRNA, blog “Soft BiteBlock: Nothing Hard About It." The Soft BiteBlock™ is made of medical grade, purified cotton. It is proudly manufactured in an approved FDA facility in the USA. The Soft BiteBlock™ is available direct from Richmond Dental and Medical, in addition to a few key distributors. We look forward to another successful AANA in Boston, September 21-25, 2018. Please feel free to contact us toll free at 1-855-841-0743, during normal business hours, from 8 am – 5 pm, EST.